Pai Hsien-yung is among the most important writers in contemporary Chinese and world literature. 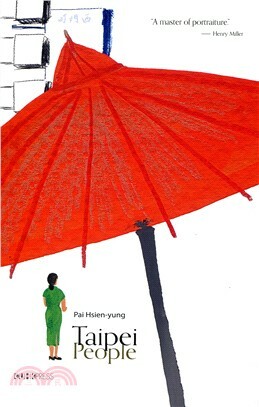 His masterpiece Taipei People is a classic of Taiwanese modernism; with an intensity of vision comparable to James Joyce’s Dubliners, it follows the individual struggles of the Taipei people, with a mix of compassion, nostalgia, mourning, and tenacious clarity. Fifty years after its publication, the collection continues to move readers around the world. Stories from this collection have been translated into French, German, Italian, Dutch, Hebrew, Japanese and Korean. Pai Hsien-Yung is an internationally acclaimed author and the founder of Modern Literature magazine. He is generally considered among the greatest living stylists of Chinese fiction and prose. His publications include the collections of short stories Lonely Seventeen, Taipei People, and The New Yorker; the collection of prose writing Suddenly the Past; and the novel Crystal Boys. Professor Pai became a professor of Chinese literature at the University of California, Santa Barbara in 1965, and retired in 1994. In recent years he has devoted his energy to the promotion of Chinese Kun opera to the world. He is the general producer and artistic director of the opera Peony Pavilion, which has toured China, Taiwan, Hong Kong, and the U.S.
Patia Yasin is a translator of traditional Chinese and Japanese folk lyrics and modern Turkish poetry. George Kao was a founding editor of the journal Renditions, published by the Research Centre for Translation, The Chinese University of Hong Kong, and the co-editor with Irving K.Y. Kao of the New Dictionary of Idiomatic American English. “A collection of fourteen short stories, Taipei People presents a gallery of Chinese mainland emigres to Taiwan after the 1949 national divide. Despite their variegated backgrounds and experiences, these individuals share one thing in common: they cannot let go of memories of their days on the mainland. As a result, the people in these stories turn their nostalgia into lived reality. ―David Der-wei Wang, Harvard University.